We are always on the look out for new sites to use for our events. If you know of a piece of land that is available for use or you have any contact names/telephone numbers to land owners please contact the competition secretary. This site promotes the Hants and Berks Land Rover Owners Club and provides information on events past and present. 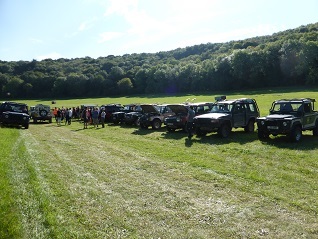 Since 1984 HBLRO has offered events for Land Rover enthusiasts in the Hampshire and Berkshire areas. The Club runs a variety of competition and open events ranging from trials through to driving days and green laning. If you are interested in joining a club that is friendly and sociable, that doesn't take life too seriously and whose main aim is to have fun in the pursuit of all things Land Rover, why not come and see us. Northern pub meets have been reinstated these are scheduled for the 1st Wednesday of the month at the Lord Derby, North Wanborough, Hook RG29 1HD 7:30pm start. There were a number of changes at the Annual General Meeting with members standing aside after many years of service in their posts. Mark Ambler has stood down as Chairman, Kevin Wood stepped down for Phil Norman to take on the role of Membership Secretary. Julian Mallard stepped down as Rights of Way officer with Russel Smith taking on this role and finally Cliare Norman took on the role of Secretary with Niall accepting the Chairmans position. We would like to thank the retiring committee for their work behind the scenes to maintain the Club and its activities. We wish the new management team every success as they steer the Club into 2019. Can we remind all members that in order to compete at Club events you need to be able to produce a valid membership card on demand. This also applies to individuals competing from MSA affiliated organisations. 2018 dates added. Keep an eye on the Calander for updates and latest information. Thanks to Nigel for passing on this YouTube footage of the SCOR RTV. The SWLRC would like to invite you to The Mendip Challenge 2018. Friday 6th July – Sunday 8th July 2018, At Lambs Leer, West Harptree, Somerset, BS40 6EN. Mendip Challenge in the Summer. We will be having the normal RTV/CCV trials, with RTV on the Saturday, and CCV on the Sunday. For the 4th year we will also be running the Mendip Team Trial, in which a team of 3 drivers will compete for an overall lowest score in one event. There is a separate competition for the RTV and the CCV, and its free to enter! As always camping will be available, with the site opening at 12 Noon, on Friday. Catering this year will be provided by Classic Catering, who will be providing a Burger Bar, as well as a beer tent and breakfast/evening meals. We are also having Mendip Challenge clothing, more details on the booking form. As always this is an ALRC event, and we will be allowing Q Class entrants. Please ensure you read the regulations and ensure your vehicle is eligible to enter. Bookings for this event are now open, and a paper booking form, as well as online entry can be found at the above link. Due to the changed dates, we are expecting entries to be high, so please enter early to avoid disappointment. Congratulations to Roger Pardy of Dorset LRC (left) winning the standard class at this year’s Interclub event. 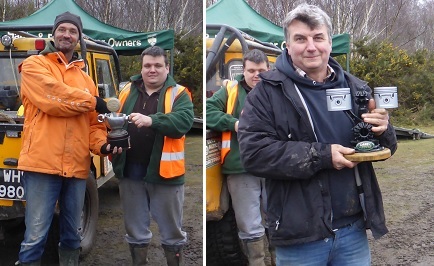 Keith Luxford from HBLRO (pictured right) took home the modified class trophy. Thanks to everyone that helped organise and officiate at the event. See you all again next year. Awards night was held on the 10th February at the Crown Hotel in Alton. Congratulations to all the 2016-17 season winners. This years calender has been uploaded. May & June dates to follow soon. Keep an eye on the page for updates and latest information. Julian is organising the annual Christmas Green Laning for the 29th December. Grab the Christmas jumper, fill the flask and head for Salisbury Plain for a days fun away from the telly. Contact Julian for reservations and meeting info. Unfortunately the planned RTV and Drive Round at Slab Common on the 15th October has been cancelled due to land withdrawl. The Club are seeking a new venue, but this would only cater for the RTV trial and not the Drive Around. Apologies for the short notice, but we do run this risk when using Army land for combined events. The weather was glorious at this year’s Summer Rally. Saturday kicked off with a Tyro; 6 competitors in all, 2 of which were unlicensed. Scoring was very low with Claire Norman storming to victory on all clear, with Elliott Norman just missing out on an all clear round scoring 1 on the last section. Jess Lamport was also running clear in her SWB series until a 2 on the last section dropped her out of contention. Saturday afternoon we were treated to the gymkhana. A fun driving event that this year included vehicle seesaw, trials section in a reverse steer Discovery, trailer reversing, extreme croquet, off road canoeing, Discovery based wrecking ball and blindfold trials section. Sunday we had the RTV with the boys & girl’s own trophies up for grabs. The Club welcomed members of Southern Counties Offroad with 5 making the trip over. The usual suspects were running very low numbers all day. Neville Dewdney was just pipped to top spot by Jack Dewdney, a replay of 2015 event. Hannah McMillan won the girls own in her Class 10 90. After a hard day’s trialling, the members relaxed in a great atmosphere with a club sponsored BBQ, where everyone came together to chat about the weekend. Stories were exchanged around the campfire well into the night. Thank you to the Club for organising a great weekend of events. Special mention goes out to Mark Ambler for devising and building the Gymkhana activities and Matt Hewitt who set out some excellent sections in both Tyro and RTV. Hope to see you all next year. Keep an eye on the calendar as this event is likely to move to the week before the Bank Holiday.